After numerous leaks, the next iteration of the Galaxy S series is finally official. The new Samsung Galaxy S5, announed at this year's MWC event in Barcelona, is a relatively conservative upgrade to the Galaxy S4, and doesn't bring some of the huge improvements that many leaks were suggesting, like a 64-bit CPU and a 2K screen. 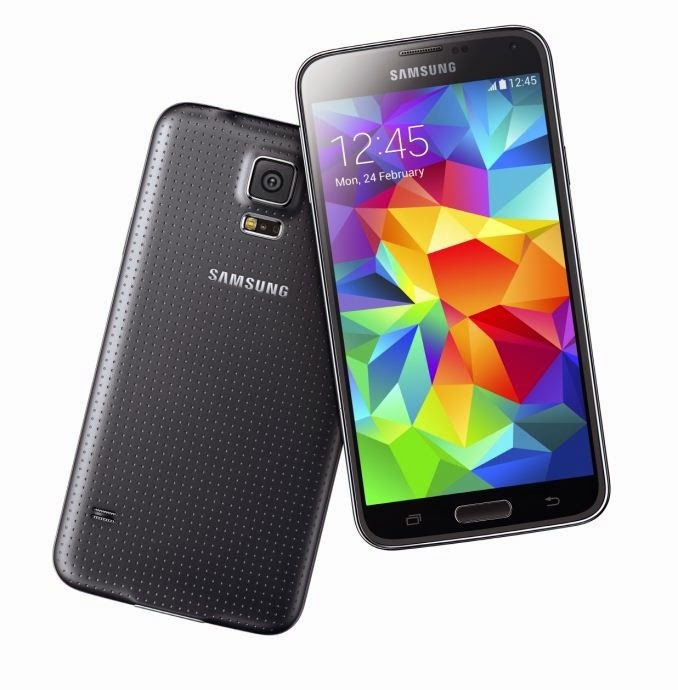 So instead of bringing something brand new to the market, the Galaxy S5 rather seeks to improve upon its predecessors. Actually, my biggest gripe with the Galaxy S5 has to do with its design. On the bright side, Samsung did ditch the glossy plastic used in the Galaxy S4 and S3, in favor of a faux-leather texture., which is still plastic nevertheless However, instead of molding the plastic to look like leather, like in the Note 3, The S5's plastic back has what looks like perforated holes, not unlike what was on the back of the 2012 Nexus 7. While it definitely looks less cheap than the glossy plastic, it's still far from looking premium and attractive. Even a simple, matte-finished plastic back like the one on the Nexus 5 or Moto G is more inviting than the S5's textured plastic design. The Galaxy S5 will be available in four colors at launch: a rather standard black and white, and two unusual colors, blue and gold. The front face of the phone remains similar to the Galaxy S4, except that the sides are a bit less rounded, like with the Note 3. The only real difference is that the Menu key has been replaced with a Task Switcher key, the Menu button now being displayed on the UI. The Galaxy S5 is significantly larger than the Galaxy S4, despite only a 0.1" increase in screen size. It measures 142mm tall, 72.5mm wide and 8.1mm thick, and weighs 145g. In comparison, the Galaxy S4 measures 136.6 x 70 x 7.9mm and weighs 130g. The main culprit for the S5's larger footprint is probably the IP67 certification, which is why I'd like to see Samsung release a non-waterproof version of the Galaxy S5, which a smaller, lighter body, perhaps (finally) with a metal construction. In any case, the Galaxy S5 isn't too big nor too heavy. In comparison to another ~5" smartphone with an IP certification, the Sony Xperia Z2, the Galaxy S5 is comparatively smaller and much lighter. The display is, on paper, almost identical to the one on the Galaxy S4. Screen size has increased only mildly to 5.1", while the resolution was kept at 1080p, resulting in a 432ppi pixel density. While that is lower than the S4's 441ppi (due to the smaller screen), the difference between 441ppi and 432ppi is impossible to notice, even with a microscope. Many rumors pointed to a 2K screen in the Galaxy S5, but I was actually very happy too see Samsung didn't make that move. A 2K screen would require too much power and GPU resources, not to mention that, at this screen size, the difference between 2K and 1080p wouldn't be very noticeable. Maybe in one or two years, when batteries will be larger and GPUs, more powerful, it might make sense to move up to 2K in smartphones, but for now it's a no go, in my opinion. The screen technology employed is AMOLED, of course, and there should be some improvements to the technology regarding brightness output and color reproduction compared to the Galaxy S4. So the Galaxy S5's screen isn't very different from the S4, but then again the S4's display is as good as smartphones should go for now, and the improvements to the AMOLED technology help make the S5's display at least slightly superior to the S4. The processor in the Galaxy S5 is a Snapdragon 801, which offers comparatively much more power than the original Galaxy S4's Snapdragon 600 processor. The 801 is, however, very similar to the Snapdragon 800 processor found on the LTE-A variant of the Galaxy S4, which released towards the end of 2013. The Snapdragon 801 boasts of four Krait 400 cores running at up to 2.5GHz, an Adreno 330 GPU with an unprecedented clock speed of 578MHz, and a 64-bit wide LPDDR3 memory interface at 933MHz. The Snapdragon 801 may not be a huge step up from the 800, but that doesn't mean it's not the most powerful SoC to date. Alas, the Snapdragon 800 already went neck to neck with the Apple A7 in some benchmarks, and outperformed it in others, so the Snapdragon 801 will only guarantee that Qualcomm retains the title of the manufacturer with the fastest SoC in existence. To put it shortly, the Galaxy S5 boasts of the best performance available in the mobile world. The Galaxy S5 packs 2 GB of RAM, just like last year's model. I expected this year's S-flagship to pack 3 GB of RAM like the Note 3, but I assume that Samsung decided 2 GB was enough for the tasks the Galaxy S5 will undertake, and frankly I agree, especially since the S5 runs Android KitKat out of the box. The Galaxy S5's battery also got bigger compared to the S4, but not by much. The difference is only 200mAh, making the Galaxy S5's battery a 2,800mAh unit. Given that the screen size and resolution are very similar to the Galaxy S4's, the overall system power consumption shouldn't increase too much with the S5, so even the mild increase in battery size will probably help increase the battery life of the smartphone. The Galaxy S5 continues the trend of continuously improving camera quality, packing a 16MP rear shooter. Aperture remains at F/2.2, and the new camera module makes use of ISOCELL technology, which means there's more separation between each pixel and improves on image resolution and increases the dynamic range. One feature which was ported over from the Note 3 is 4K video recording at 30FPS. We still don't have image and video samples for the Galaxy S5, but I'm confident that image quality will be significantly improved over the Galaxy S4. The front-facing camera is a 2 MP unit capable of 1080p video recording. Until now I only talked about improvements over the Galaxy S4, but what brand new features does the Galaxy S5 add? Firstly, there's a brand new take on smartphone fitness features with a heart rate monitor, which is located next to the LED flash. Some people will find this feature gimmicky, but I can definitely see it being useful for people who have an active lifestyle (this fits perfectly with the ruggedness of the Galaxy S5). Also, in response to Apple's Touch ID fingerprint scanner, Samsung has introduced a slightly different kind of fingerprint scanner on the S5. Instead of being on the home button, like on the iPhone 5s, the Galaxy S5's fingerprint scanner is built into the bottom-center portion of the screen, and it's activated by swiping it, rather than holding it. It's not as convenient as Apple's solution, but it's still very good nevertheless.